What have you done for me lately, Firefox? 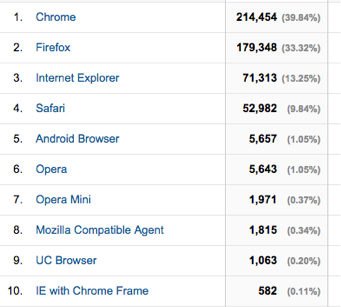 I read at Firefox Fightback that Firefox wants to regain market share and a few highly placed folks have left. Market share? In this household, they have none at all. There was a time when I ran and recommended Firefox everywhere, but bloated and crash prone code caused me to move to Chrome in 2009. Since then, I've been happy wih Chrome until the very latest version, but now that has been freezing up on me at times so I thought I might take a fresh look at Firefox. But Wikipedia says it is currently only "the third most popular web browser", and StatCounter says it's a poor third place at that (StatCounter Global Stats - Browser Market Share). Fast again: Poor performance was one of my major reasons for defecting, but that seems to be fixed. I'm not interested in benchmarks; I don't know or care if it is faster or slower than Chrome or Safari - I just don't want a fat, wheezing Fox slowing me down. It isn't doing that to me now, so I'm happy. Crashing: That hasn't happened yet, but they do have a Firefox crashes - Troubleshoot, prevent and get help fixing crashes page. Customization:Firefox lets you easily (drag and drop) customize your menu bars. That's nice and it's easy to do. Yahoo for search? Are you kidding me? I understand that they don't like Google because of Chrome, but setting the default search to anything but Google is idiotic. IOS version coming soon? It's 2015 and they are just getting around to an IOS version? Wow. Am I a believer again? I don't know. I'll try it out for a while and see how I feel. -> What have you done for me lately, Firefox?